Cube butter then place in the bottom of a large (I use a 7 quart) greased crock pot. Wash and peel potatoes, then cube. Place potatoes and chicken pieces over butter. Season with black pepper. Pour in chicken broth and corn. Cover with lid and cook on low heat for 6 hours OR on high heat 4 hours. After time is up mix together cornstarch and water to create a slurry. Pour into crock pot. Then pour in the heavy whipping cream. Gently stir to combine everything. Cover with lid again and cook another 20 minutes or until chowder has thickened. 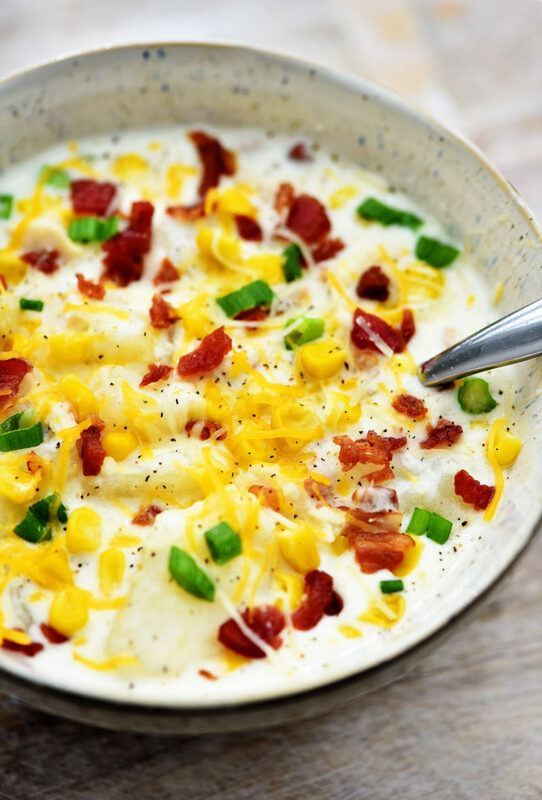 Serve warm in individual bowls and garnish with bacon, cheese and green onion. Enjoy!